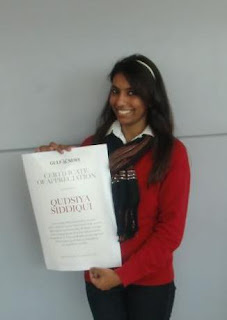 Congratulations to final year media student Qudsiya Siddiqui who was officially lauded for her citizen journalism piece for the month of December by local newspaper, Gulf News. Qudsiya is currently specializing in journalism translated her theoretical knowledge and applied her reporting skills as a citizen journalist for Gulf News. Her article urges the need for public restrooms for picnickers on the shores of Al Khan Lagoon published in Gulf News on 19 December, 2011. Siddiqui raised awareness about the lack of vital services at the Al Khan Lagoon in Dubai. As the beach is a local hotspot and attracts scores of visitors, she felt that easily maintainable public restrooms and showers should be a top priority. She said: "Community journalism is truly on the rise as through community reports residents can share their opinions and views on issues that need to be paid attention to. "And so far there are no signs of improvements and the lack of public restrooms remains a problem at the Al Khan Lagoon while it continues to be a popular holiday spot on the weekends." The community reports published in December were judged by Senior Hub Editor Meher Murshed. The criteria for selection included content, issue, impact on community, responsibility and the quality of contribution. Beaches in the UAE are a key location for citizens to enjoy throughout the year, but a lack of facilities can hinder the experience. Qudsiya Siddiqui's winning community report on the lack of public restrooms near the Al Khan Lagoon is effective in highlighting an issue many beach-goers face. Senior Hub Editor Meher Murshed said: "We always raise environmental issues, and this needs sorting out immediately. It will provide relief to beachgoers and protect the environment." To read more about community reports, click here.